Unharvested fields like this one near Arcadia in November are now full of snow. The U.S.D.A. 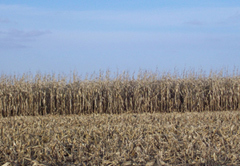 estimates up to six percent of the 2009 Iowa corn crop is still standing in the fields, amidst all this snow. State Ag Secretary Bill Northey says you can run a combine through a corn field that has a couple of inches of snow on the ground, but the winter storm that swept through the state and dumped over a foot of snow in many places has put a halt to harvesting. According to the U.S.D.A., there’s about 800,000 acres of corn still standing in Iowa — and it’s worth about half-a billion dollars. Depending on weather conditions for the next few months, some farmers may not be able to reach their fields until spring. Northey says, generally, the quality of the corn won’t change much after the first snow flies. Northey, who farms in northwest Iowa near Spirit Lake, got his crops out just before Thanksgiving. While there are pockets of corn still standing throughout the state, Northey says some farmers in southern Iowa “have more than their share” of corn that hasn’t been harvested. The U.S.D.A. estimates 9.5 million acres of corn has not been harvested yet in the U.S. U.S.D.A. experts peg the value of the corn crop that remains in American fields at $5.3 billion.